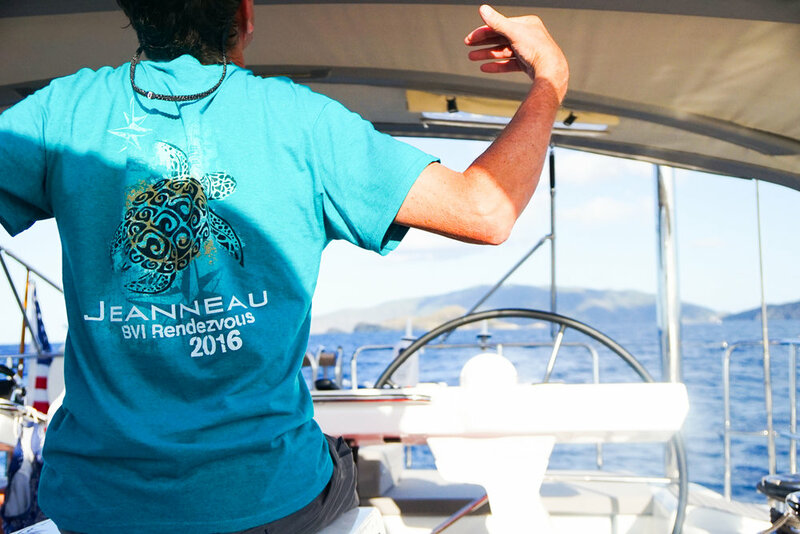 Last month I had the pleasure of attending the 2016 Jeanneau Owner's Rendezvous in the British Virgin Islands. This is the third time Jeanneau America has hosted the event since it was first started in 2012. And while no two rendezvous' have been exactly the same, they have all shared the same basic DNA: sailing, adventure, fun, laughter, good times, great memories, and new friends. And of course the love of Jeanneau. This particular rendezvous was especially good on several levels. For starters, among the 20 or so boats we had participating, was the brand new Jeanneau 64, Serenity. Having the flagship of the Jeanneau range on hand for the week, fully crewed by the way, truly added an exciting dimension to the overall event. We were also fortunate to have sailing legend, Gary Jobson as our guest speaker at the Bitter End Yacht Club compliments of our friends at Cruising World Magazine. Gary gave an outstanding presentation on a variety of subjects from the America's Cup Race to the infamous 1979 Fastnet Race to stories of the cruising lifestyle. There's no doubt that sailing for a week in the British Virgin Islands is tough to beat. And as good as the entire BVI rendezvous was this year and will be again the next time, there are several other local rendezvous' that are just as good and probably easier to get to as well. To begin with, there is the Can/Am Rendezvous that takes place over the same weekend as Summer Sailstice, June 17-18. This rendezvous located in Anacortes, WA, is hosted by Marine Servicenter and will be celebrating its 15th year this year. Also celebrating its 15th year and also taking place from June 17-18 is the Western Canadian Rendezvous hosted by Fraser Yacht Sales and being held at the Poets Cove Resort in the Canadian Gulf Islands. This has always been a Jeanneau favorite and I have no doubt that 2016 will be another great year for this popular event. The Chesapeake Bay Rendezvous sponsored by the Jeanneau Sailboat Owners and Atlantic Cruising Yachts also takes place June 17-18 in celebration of the summer solstice which occurs on Monday, June 20th. Larsen Marine of Waukegan, IL will hold their rendezvous in July this year from the 15th to 17th in Milwaukee while the Jeanneau Rendezvous to Catalina Island hosted by Cruising Yachts will take place from July 27-30. Lastly, Navy Point Marine will offer some real excitement this August in the form of a cruising rally that begins in Toronto and ends at the other end of Lake Ontario at their marina in Sackets Harbor, NY. This sounds like a real adventure and one I know I don't want to miss. At Jeanneau, we have always been proud of the boats we build. And why not, they're great! But as good a we know our boats are, without the people who own, sail and enjoy them, they're just a boat. A Jeanneau rendezvous, whether in the BVI, Pacific North West or Chesapeake Bay, bring Jeanneau owners together to share stories, make new friends and have fun. And that's really what owning a Jeanneau is all about, having awesome times in awesome places with awesome people. So let's rendezvous Jeanneau fans and let the good times roll!